glplotter draws graphs. 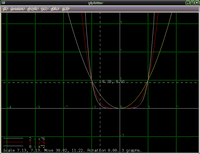 It can generate graphs of various functions (you can specify any mathematical expression as function expression, e.g. 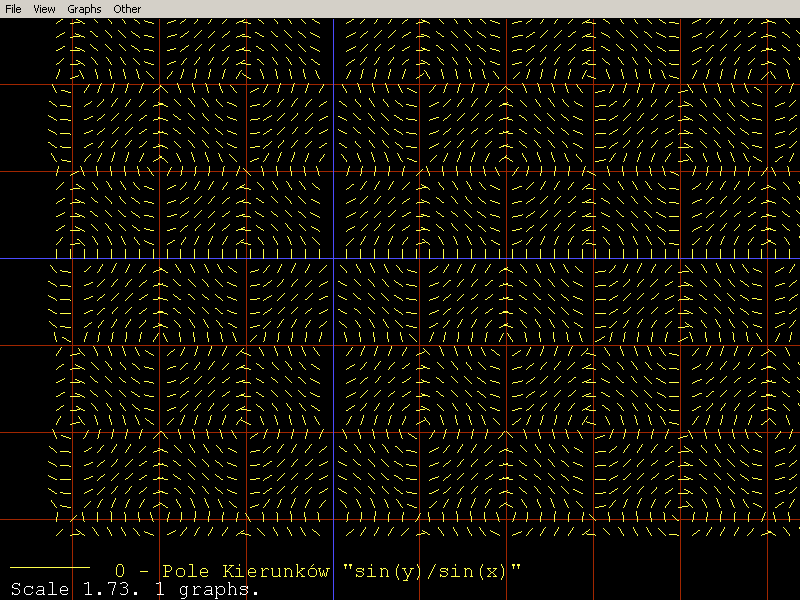 "sin(x) + x^2"). 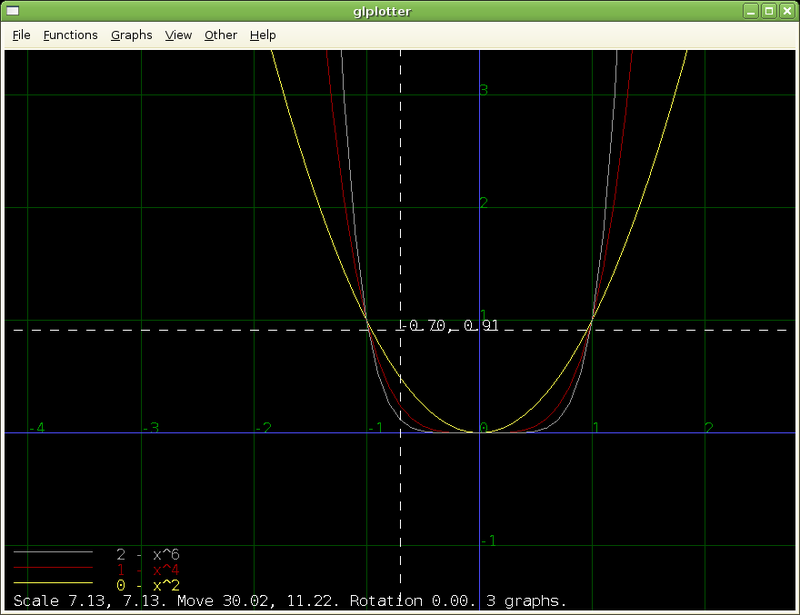 glplotter can also load a graph from a file. This is useful if your graph data doesn't come from any mathematical expression — e.g. maybe it's some collected statistical data. Maybe your data is not even a function at all — actually any shape consisting of line segments may be displayed by glplotter. That's pretty much everything you need to know... you can download and run glplotter now, the interface should be self-explanatory. You can pass at command-line file names from which to load graphs. Dash (-) as filename means "standard input". 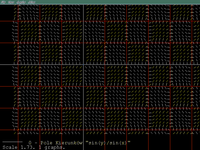 will display graphs of sinus and x2 at once. Of course, in case of function expressions, it's usually more comfortable to set them up inside glplotter using "Functions" menu. Options --light and --dark allow you to choose appropriate color scheme. See also standard parameters of OpenGL programs and standard parameters of all programs. Graph for glplotter is actually just a set of line segments. They don't have to correspond to any function — they can show any shape, they can cross each other etc. Lines starting with # (hash) are comments. Lines with two float numbers (separated by any whitespae) represent another point of the graph. You can use decimal or scientific float format (like 3.14 or 10e-3). A line segment will be drawn from this point to the next one (unless a break will occur). Line with only break word means a break in a line segment sequence. Line like name=<graph_name> specifies graph name (will be used in glplotter legend). Whitespace at the beginning and end of the line is always ignored. 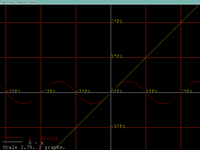 gen_function generates graph file from given function expression. 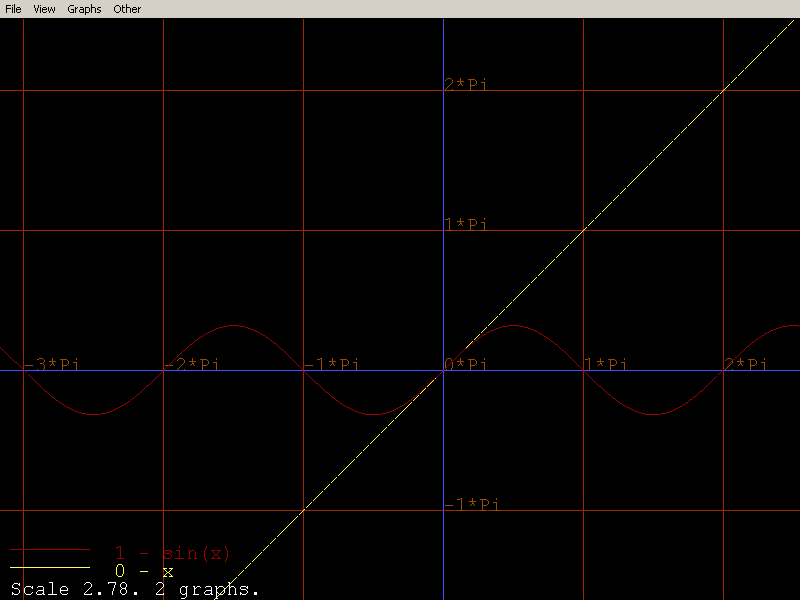 It's seldom needed — glplotter can make a graph from function expression on it's own, see menu "Functions". This will write on standard output the graph of function <function> for x in range [<x1> ; <x2>] (with x sampled at each <xstep> distance). The graph will be in format understood by glplotter. Short overview of mathematical expressions syntax: this is really just normal syntax of mathematical expressions, as used in all software and resembling normal mathematical notation. When we deal with function expressions, then x represents the argument, e.g. (x+4)*3+2, sin(x) etc. For detailed information about syntax and built-in functions, see CastleScript language reference. We use a subset of CastleScript syntax, allowing only a simple expression as a function expression, operating on argument "X".